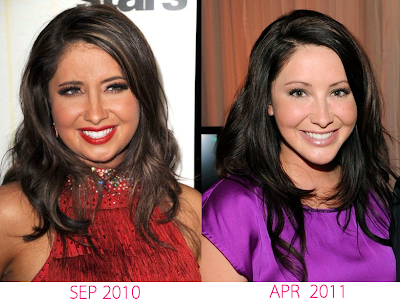 Bristol Palin Before After Chin Implant Plastic Surgery? Extra, extra, read all about it, daughter of presidential hopeful, Sarah Palin, sparks buzz amid plastic surgery rumors! You heard it folks, Wasilla born mother of one, and recent contestant on 'Dancing with the Star', Bristol Palin, is rumored to have undergone chin augmentation plastic surgery, after debuting a radically new appearance while gracing the red carpet at last weeks 'Candies Foundation' event in New York city. See the before and after pics below. And while its quite evident that Ms. Palin has indeed lost a significant amount of weight, and received a serious fashion makeover, it also appears that the 20-year-old abstinence advocate has been dabbling in a little plastic surgery, to boot. And despite rumors running rampant, the Palin camp has yet to address the topic publicly, not even a tweet worth of cynicism has been uttered thus far, however, the numerous before and after photos that are making the rounds, speak loud and clear. Checkout the comparisons, which display Bristol Palin before, with her modestly sized chin, and after photos that showcase a very prominent and well defined chin, that doesn't quite sync with the rest of her natural features. There has also been a handful of ill-advised rumors, generated from a few gossip blogs, suggesting the possibility of liposuction and a brow lift procedure, but those accusation seem a little far fetched at this point. This might seem like an open and shut case of chin plastic surgery, but until Bristol or the Palin posse sheds some further light on these mind boggling snapshots, we will label this case as a "plastic surgery hung jury". I think she looks great. She looks less chipmunkey.